✔️ Will will continue to celebrate how #OttawaIsCreative and welcome all! 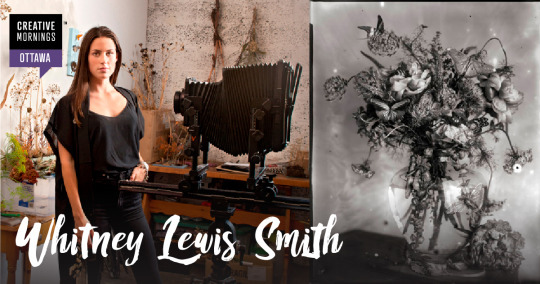 Our first speaker of 2019 is photo-based artist Whitney Lewis-Smith to speak on the global theme Surreal. Her work uses a combination of historic and modern photographic processes as a means to speak on contemporary topics, most recently discussing consumerism, commodity accessibility, and globalization’s impact on the environment. By referencing dutch golden era floral tableaus, Whitney highlights the evolution of humanity’s relationship with the planet. Her seemingly living moving scenes are made predominantly using insects, animals, and plants that have died, but this only becomes apparent upon close inspection. The result is a subtle tension, engaging the viewer’s fascinations and fears. Tickets to #CMsurreal will go live on Friday, January 18 on our website and the event will be held at 8:30 am on Friday, January 25!